LINQ to SQL by default loads related entities and entity sets by using Lazy Loading. Which means if you retrieve a list of entities in a query that references other entities these other entities are not actually loaded unless you physically access them. Lazy loading is quite useful in some scenarios – typically when you load up individual instances for display purposes in simple record based UIs, but it can be a real problem when displaying list based data that needs to have access to related data. In related list scenarios it’s quite easy to have a list that has 100 records displayed on a page to fire off 100 hundred child queries to retrieve the related data – clearly in most cases that’s quite undesirable. 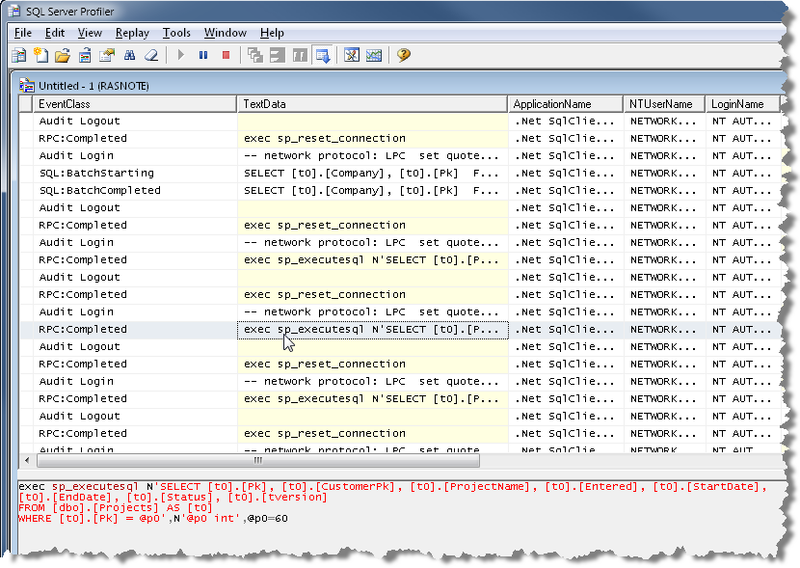 Lets look at an example, from my Time Trakker sample application for the LINQ to SQL business layer. So if I have an EntryEntity I can get a project with Entry.ProjectEntity and a customer with Entry.ProjectEntity.CustomerEntity. So far so good. The parameter object has things like a date range, which type of entries to retrieve and so on which are applied against the mode in the query consecutively. This incremental building up of queries using Linq’s fluent language interface is one of my favorite LINQ features. The result of this query is then returned as an IQueryable<EntryEntity>. 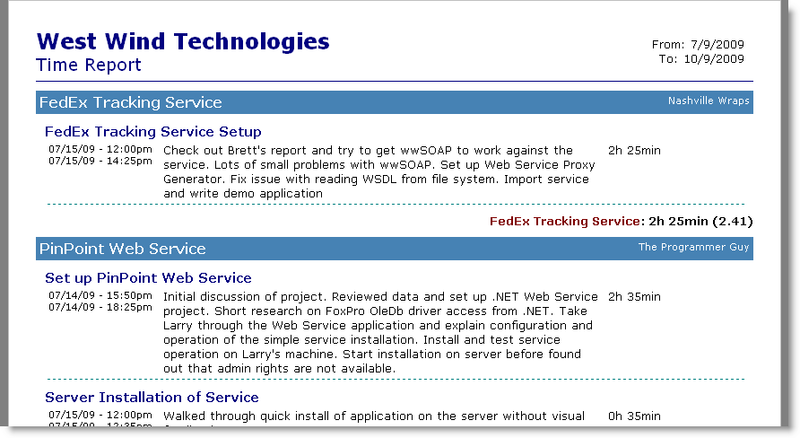 Notice the headers which include the customer name and project name which come from related entities. The main data displayed for each entry all comes from the Entry entity and that’s fine. However there RenderProjectGroupHeader() method figures out whether the group changed and based on this needs to access the Customer and Project information. And here you can see the child entities being accessed. 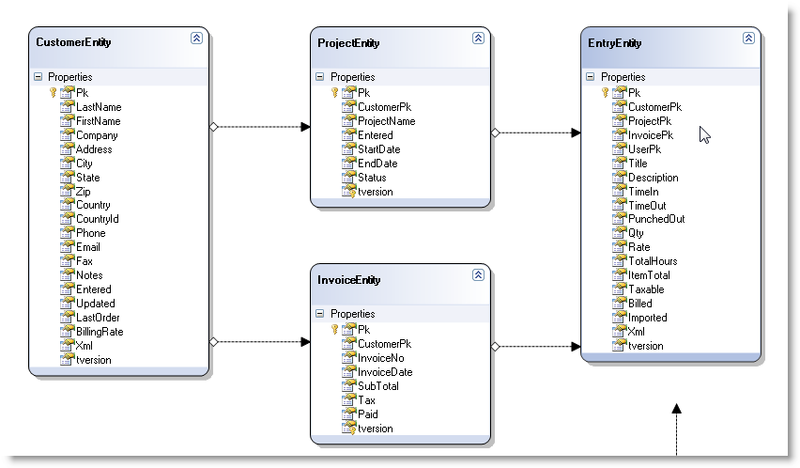 It turns out that each access to the ProjectEntity and CustomerEntity object causes a separate query to the server (shown) for the first time a particular Project or Entity is referenced. This means for each project in the application there will be two additional queries hitting the server so if I show 20 projects I’ll hit the database 40 extra times. That’s lazy loading for you and it’s usually a problem in list based displays like this. It can be much worse if EVERY row you display requires one or more related entities. LINQ to SQL loads related entities and entity sets using lazy loading. Oddly you can’t override this behavior either in the model – even though you can delay load individual properties (like large text, image or XML fields). So everything always lazy loads. This works and results in one large SQL statement that preloads the customer and project child entities. However, this approach is problematic in a number of ways if you’re like me using a persistent data context. In my applications I scope a data context to a business object, so multiple operations may be performed against a single data context instance. If you have more than one operation that’s called and setting the DataLoad options it’s easy to clobber the settings on this object. A common problem when you have a persistent object like the DataContext and with L2S it’s difficult to get away from storing the context in some sort of persistent mechanism as it’s a connected ORM. The fact that the options are tied to the DataContext rather than the query itself also makes it much more difficult to customize the query externally depending on the usage of the result. I often pass out an iQueryable and allow customization of the result set. Outside of the business layer the DataContext and therefore the options are not available and so it can’t be set externally. Finally the DataOptions are tied to full related entities. If you just want to preload a property or two (like ProjectName and Company in our example here) you’re out of luck. DataOptions only deal with full entities. But there’s another way to write your queries differently to effectively force LINQ to SQL to prefetch by using projection in the Select clause of the LINQ statement. Basically the idea is to project the related entities or simple properties at the top level of the returned result to force the data to be denormalized and so becomes effectively preloaded. I’m using an explicit type declaration here rather than an anonymous type because the helper methods of the report rely on an entity instance to retrieve customer and project information and an Anonymous object would not allow access of properties beyond the declared query scope. The explicit object gives me a strongly typed object I can pass around the report UI methods without resorting to Reflection. If you don’t pass the returned result around and bind it immediately the explicit type is not required which is one less thing to declare. Denormalized alright, but what this does is effectively provides the necessary data for all Entry, Project and Customer entities to be completely filled. Note that I can still bind to entry.ProjectEntity.ProjectName and this works without another trip to the database because the Project entity was preloaded in the repItem.Project property. This the same instance that’s referenced in entry.ProjectEntity just as repItem.CustomerEntity is the same entry.ProjectEntity.CustomerEntity. By including the Customer and Project entities as projected values in the query we’ve forced them to preload and we've reduced 40 queries to just a single (but large and redundant) query. This example loads the full customer and project entities, but realistically we only need the Company and ProjectName fields from the respective related tables. If you know up front you only need a few of the fields in a table it’s more efficient to load just that data in the projection which has roughly the same effect. Again this is easier if you can use an anonymous type, otherwise the projected type instance has to reflect this layout. because it reduces the amount of field data for each row of SQL result data significantly. You have to be careful with this though – in the above scenario if I access entry.Entry.ProjectEntity.CustomerEntity.Address I will end up lazy loading both the Project and Customer records from the database. In this instance only the ProjectName and Company were retrieved, not the entire entities. IOW, if you pull just a few fields of related entities make sure you stick to using only those fields and leave the actual related entities alone. Arguably LINQ to SQL’s lazy loading functionality behavior without override ability is not exactly intuitive, but it’s not terribly complex to force it to return pre-loaded data either. It does require some foresight as switching between lazy loaded and pre-loaded entities effectively requires some code changes to reflect the project type’s structure. It would be much nicer if there was syntax that would let you specify a prefetch path right on the query (something I really like about llblGen’s LINQ implementation). Also keep in mind that lazy loading isn’t always bad so this isn’t something that should be done on every query. Denormalized data retrieves a lot of repetitive data so you’re often sacrificing data on the wire for fewer round trips to the database. In many situations – especially record level CRUD operations – lazy loading is usually a great way to go. Even small list based displays might not suffer severely from many requests to retrieve data vs. running a single query to retrieve the data you need. Also keep in mind that child items don’t necessarily load for EACH and every row, but only the first time a particular instance is loaded, whereas a denormalized query ALWAYS retrieves the related data for every row. So a list with a lot of repeated related data may not actually access the database as often as you might thing. It’s a tradeoff and experimentation is required to see what works best in each situation. But with a little bit of extra work you can make L2S do what you need it to. I was wondering, would a join also invoke loading of a whole object? Let's see if I can give an example. We have the tables companies and locations. Connected via a FK. but can you explane more about Lazy Loding ? @Masoud - Lazy loading is described at the beginning of the article. It's delayed loading of related data until you access the related entity or entity which causes a separate query to the data base at the time of the access. Very good and insightful read. I can see cases where this will help in my app creation. Thanks, Rick, for all the content you generate on these real world topics. When I use this kind of projection and profile against the database, LINQ to SQL still seems to be running multiple queries to generate the results. This article was very helpful - thank you! You mention a Time Trakker sample application. When I tried to Google that, though, I found a page on your site with FoxPro links from 1996. Is there a way to obtain the LINQ to SQL version of your Time Trakker sample? Going to Phuket in December. Have yet to apply for leave, which is dangerous. Very helpful read, thanks. I'm new to LINQ, coming from a database-centric background where much of the business logic was in the DB. In that world, I would have created a View for the report rather than trying to control the joins etc. in the C# code. Is there any reason not to do that and then use LINQ to access that View? I get especially nervous when I see the auto-generated code uses a LEFT OUTER JOIN SELECT 1 on Customers: is it really possible to have a Project without a Customer? And why only SELECT 1 Customer, as if there could be multiple Customers per Project? Maybe you don't have foreign keys defined, and it would generate different T-SQL if you did?